Have your fiddle-related event listed here free of charge! Email mary@fiddle.com with the info. Fiddle-icious Traditions, Lewiston, Maine, April 12-14 2019. Featuring artists from Cape Breton: Troy MacGillivray, Mac Morin, Wendy MacIsaac, and Andrea Beaton! Also incredible New England musicians: Rob Flax, Neil Pearlman, Greg Boardman, Pam Weeks, Bill Olson, Erica Brown, Matt Shipman, Lauren Rioux, Cindy Roy, and Elaine Malkin. Enjoy classes in melody, rhythm, piano, learning by ear, step-dancing, jams, a contra dance, and a concert finale! Lodging nearby. Breakfast and lunch included on Saturday and Sunday. For more information: https://fiddleicioustraditions.com/ Created by Don Roy, 2018 National Heritage Fellow and music director of Fiddle-icious, Maine's Largest Fiddle Orchestra. Weiser Bluegrass Music Camp (for guitar, fiddle and mandolin), Weiser, Idaho, May 2-5, 2019. Intensive 4-day camp in an intimate setting at the National Old Time Fiddlers' Contest and Festival, with instruction, jams, concerts, and more. Instructors will be Chris Jones (guitar), Megan Lynch Chowning (fiddle), and Joel Kaserman (mandolin). Nevada State Old-Time Fiddlers' Contest, May 3-4, 2019, Eureka Opera House, Eureka, Nevada. For more information, visit nevadafiddlerscontest.com. World Fiddle Day in Scartaglin, Co. Kerry, Ireland. We will celebrate the fifty year anniversary of one of the finest all fiddle LPs ever made. 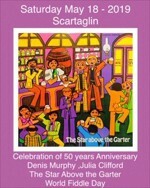 "The Star above the Garter" by Denis Murphy and his sister Julia Clifford was first released in 1969. Scartaglin will come alive with lectures, workshops and fiddle recitals on Saturday, May 18. All events free. For more information, visit worldfiddledayscartaglin.ie. Mountain Acoustics Luthier Invitational, May 25-26, 2019, Town Center, Burnsville, NC. This luthier-focused, two-day event is bringing together 30 to 34 of the most recognized luthiers in the southeast. Luthiers from NC, SC, TN, VA, WVA and GA will showcase their handmade instruments including fiddles, guitars, mandolins, violins, ukuleles, banjos, dulcimers and harp. The event will include workshops. For more information, visit MountainAcoustics.com. Fiddle Hell Massachusetts Festival, Westford, MA, Nov. 7-10, 2019. Fiddle styles: Bluegrass, Cajun, Cape Breton, French Canadian, Jazz, Irish, Klezmer, New England, Oldtime Southern, Scottish, Swedish, Swing, Texas, Western Swing. Instruments: Fiddle (of course! ), mandolin, cello, guitar, banjo, singing, dances. Levels: Beginner through Advanced. Fifteenth annual gathering, with inexpensive rates for 2, 3, or 4 days, or even just 1 day. DIscounts for kids, young adults, seniors, and for advance payment. 90 instructors lead 450+ workshops and guided jams and play for 12 mini-concerts throughout the four days in picturesque New England Inn. Free parking all 4 days. Public concert and dance Nov 9 at 7PM (doors open 6:30), $20 at door. More info: Fiddle Hell Website, Fiddle Hell Massachusetts Facebook Group, or call (781) 367-7316.